Arcade Yum looks like a very useful application and many people leave it on the system in order to be able to play games. 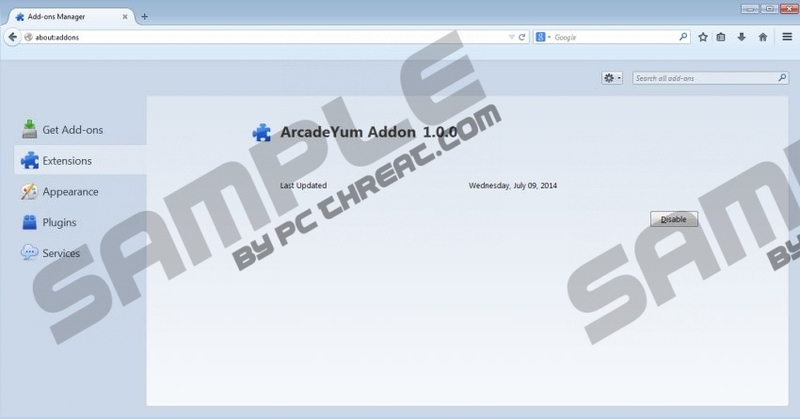 Unfortunately, the researchers of pcthreat.com have revealed that Arcade Yum might be a reason why so many threats are present on your system. Therefore, we recommend being extremely cautious. Actually, it would be very clever to ignore ads that Arcade Yum display on your screen. If you listen to our advice, you will definitely avoid infections that are just waiting for the opportunity to enter your system. The specialists of pcthreat.com have tested Arcade Yum and found out that it is very similar to such suspicious programs as Arcade Safari, Arcade Frontier, Great Arcade Hits, Arcade Parlor, and Top Arcade. As it does not differ much from the aforementioned applications, it is not surprising that it tends to enter the system without user’s permission as well. It has been found out that it is usually distributed via Fusion installers. On top of that, it comes in a bundle with such programs as MyPCBackup, Retro Calculator, YTDownloader, and others; thus, you should check whether they are not present on your system as well. If you want to get rid of Arcade Yum easily and quickly, you should follow the instructions that we have prepared for you step by step. Another way to erase this program is to scan the system with a trustworthy antimalware tool, for instance, SpyHunter. Do not forget to keep it enabled in the future as well in order not to allow serious infections enter your system in the future. Quick & tested solution for ArcadeYum removal.